I don’t understand why you’re complaining about the Windows ecosystem, when the origin of your problem is the lacking macOS ecosystem. The XPS laptops offered by Dell currently look like strong, viable hardware alternatives which leaves Windows and Linux as operating systems. My Dell came with Windows 10 and I’d like to give it a chance. In contrast, to take the sting off a bit, I have a late 2015 Dell XPS 13. It took me 2 days to install Linux and because I encrypted my partition I have to go through the grub menu to boot. Are you sure this stuff comes with windows? I’ve never had adverts for Candy Crush Saga or Photoshop elements? Mind you, I did upgrade from 8 rather than buying OEM, and unticked as many things as a I could on the install options, maybe something I did there nurfed the ads. @David Jones at least you can still use grub. To get Arch to boot from the NVMe SSD in my XPS 15 9550 I had to learn wot systemd-boot is. I really think Windows 10 is great. Much better platform than OS X (I can really take hardware to extreme and pay less for better hardware). I was never bothered by those ads and removing the applications can be done in 2 seconds. Windows 10 is stable, fast and modern. If those ads are your case against Windows 10, well, it seems you are in the correct OS. I recently bought a Chillblast desktop PC (https://www.chillblast.com/) with Windows 10 Home. I’ve not noticed any of the things you mentioned. Could some of them be due to the way Dell set things up? If you buy products from the Microsoft Store, you typically get a “Black Edition” with no 3rd party bloatware. So, I haven’t noticed this “feature” of OEMs for years as I’ve been a loyal Surface customer. 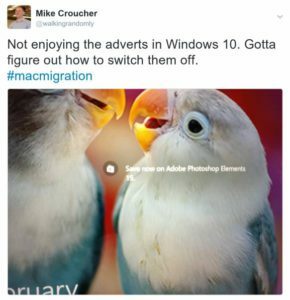 Let’s be clear here — I am not saying that I’ll not use Windows 10 because of the ads. As I wrote in the post and as others have said here and on twitter, they can easily be removed. I just feel that they make Microsoft look cheap. Microsoft are doing better every day and I feel that they are listening to customers. Perhaps they’ll listen here and remove the ads? @David Cuccia I was extremely tempted by the surface line. The more powerful hardware is what swayed me to the Dell. @Nick Higham – The experience seems to vary wildly. It could have been Dell but some report similar experiences on other hardware. @Royi – OS X certainly has limits that bother me. I’ve not yet pushed my new hardware — would love to know more about what you are up to. I would suggest something like http://getblackbird.net/ to get rid of annoying features and improve security/privacy. What I meant is Windows let you do what ever you want. Everything is exposed (Drivers, Registry Settings, etc…). You can configure easily the background Processes of the Operating System (Turn off those you don’t need). Windows 10 is very stable in my experience. And, at least my impression, same software on the same hardware seems to be faster on Windows (Checked on Photoshop).